We received news this week that Philippa’s recent collaboration with Tamar MacLellan – Meeting in the Middle – has been selected for Sarah Bodman’s 2016 Top 10. 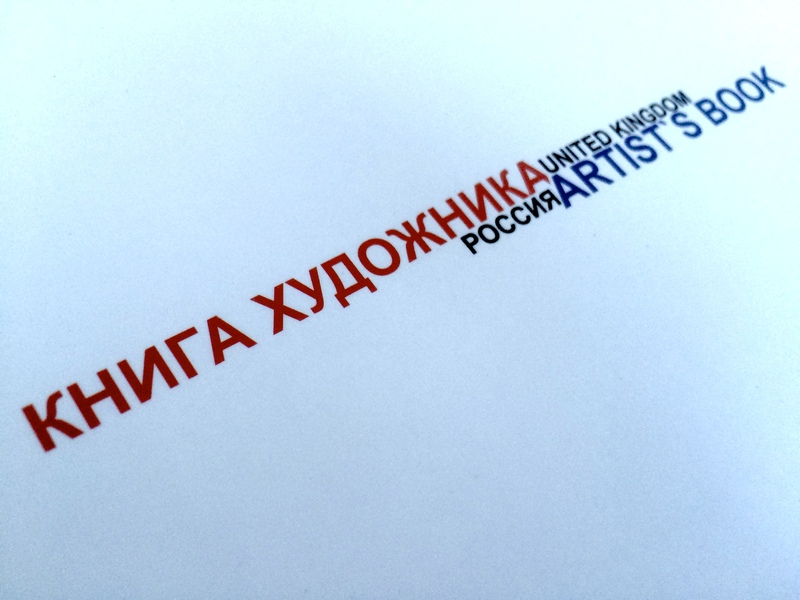 The complete list appears as part of Sarah’s artists’ book series for a-n (the artists information company). We are told the order is based on the editor’s preference for mixing images – see link below. 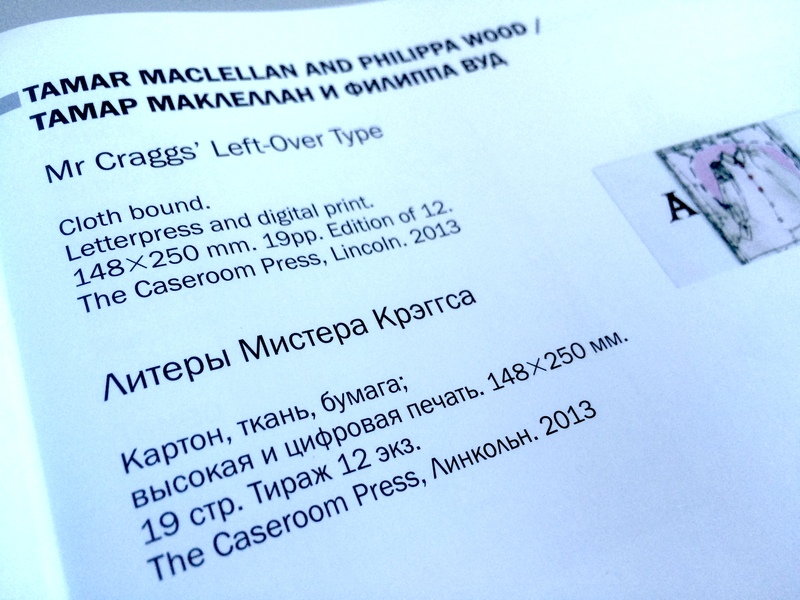 The Caseroom Press have been to Russia. Well, a couple of our books have. Some months ago we were contacted by someone from the team of Barbara Guarducci – contributors of the new Pantone View website which is dedicated to colour created by Pantone. We were asked to submit work for an article entitled Indie Publishers – and here we are, it’s rather short and sweet, but we really appreciate the inclusion. Plus the one Barrie’ll be getting for the office wall. Obviously. Thanks to Tasha for the photos and to Joanna, Hayley, Keira and Lewis for the heads-up. Barrie would like to point out that Flora Stacey’s Butterfly piece isn’t the first known example of Art-typing, but she was the first person to find fame as a Typewriter Artist, and eight pieces of her work were included as part of the Bar-Lock Typewriter Exhibition in the Chicago World’s Fair of 1893. As you can imagine, he can get a little boring in the office. 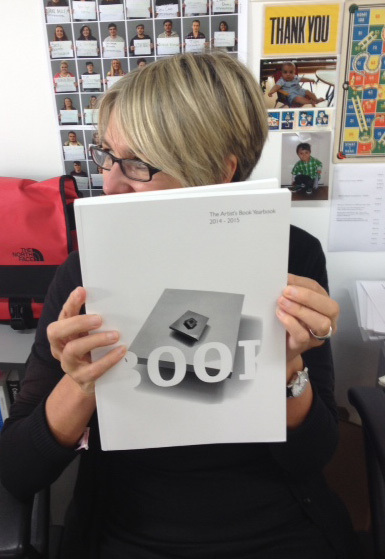 The latest edition of the Artist’s Book Yearbook 2014–15 has just been published and we are happy to show off the Caseroom’s contribution. 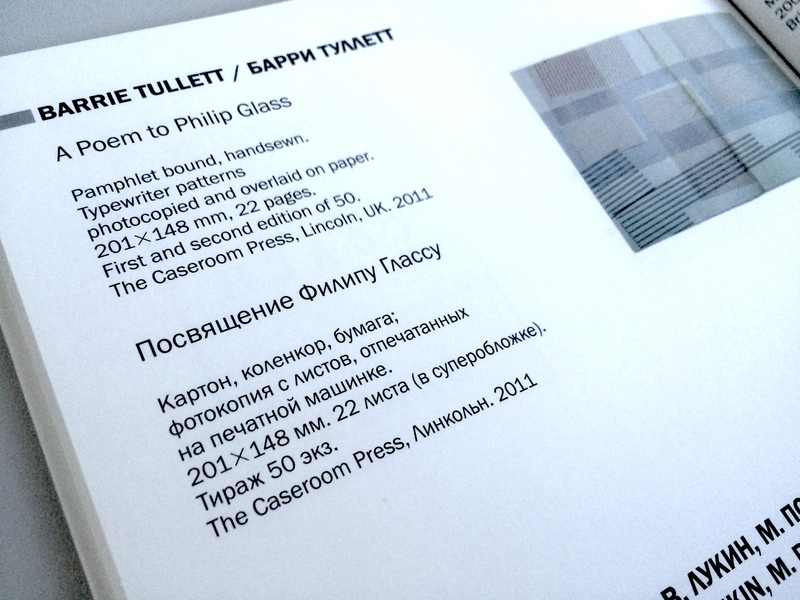 Barrie has written an article entitled The Typographic Dante, a subject close to his heart — which is an interesting and insightful read and written in true Tullett-style; whilst Philippa has produced one of the nine artist’s pages within the book. 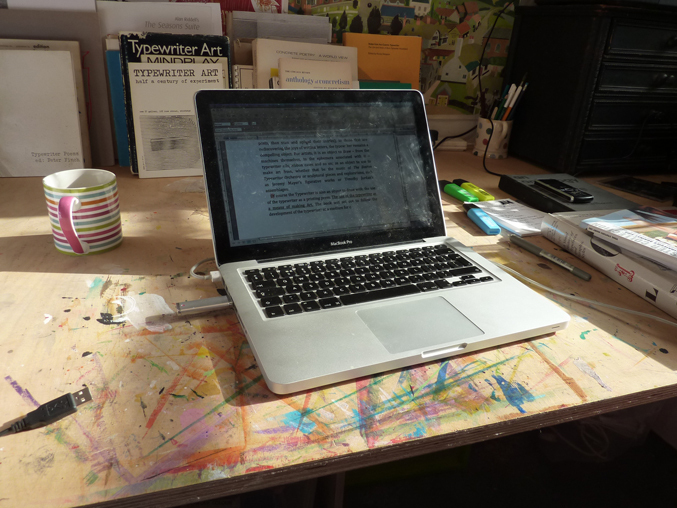 The piece entitled A Year with Angie is based on the emails sent between Philippa and artist Angie Butler as they undertook a long-distance collaborative project. Taken out of the context the email titles become a sequence of juxtaposed phrases that plot the creative journey. 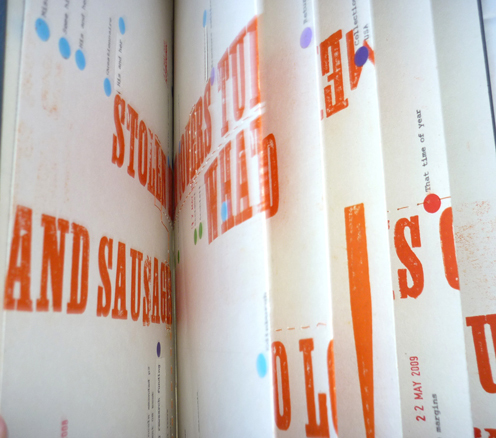 The ABYB is edited by Sarah Bodman, art direction by Tom Sowden and published by Impact Press, UWE Bristol. Thank you to both Tom and Sarah for inviting us to be apart of this biennial publication. 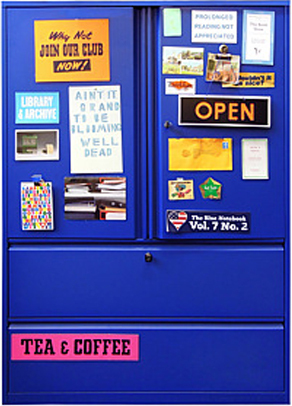 The latest edition of The Blue Notebook features an article by Dr Emma Powell who explores the development of ‘we love your books’ – the collaborative partnership she founded with Melanie Bush. 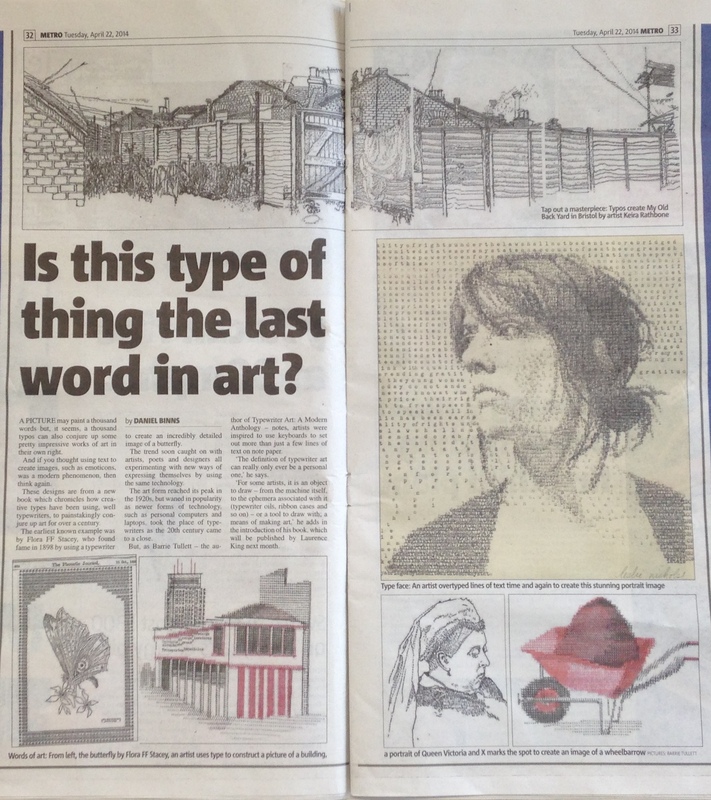 Philippa is one twelve book artists featured within Emma’s article. The Blue Notebook is published by Impact Press, CFPR, UWE. 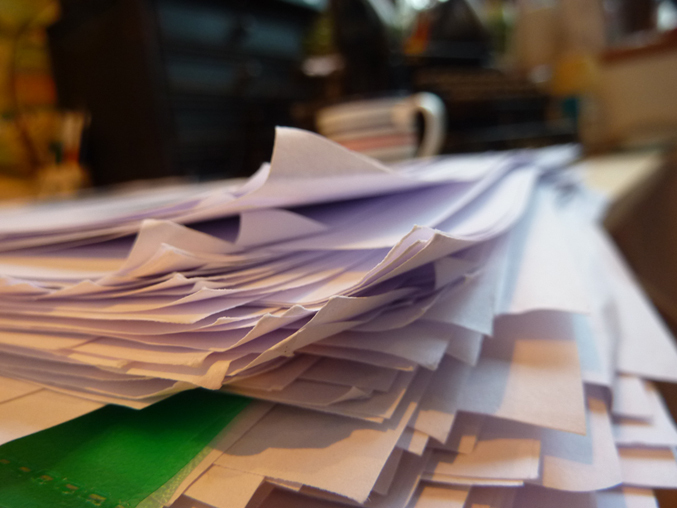 Barrie is currently working on the manuscript for the book he’s been commissioned to write. 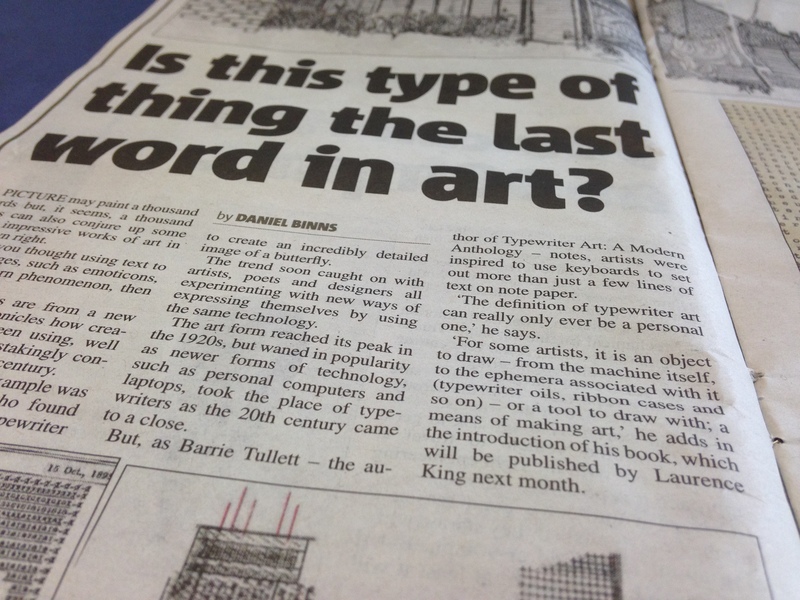 A Modern Anthology of Typewriter Art – due to be published later in the year by Laurence King. He’s thinking it might need a snappier title. 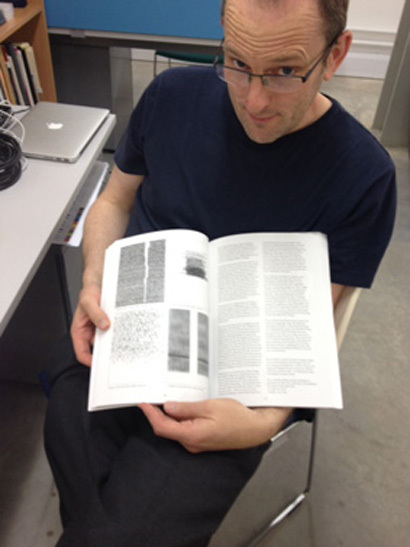 The book is an overview of Typewriter Art from the late 1800s to the present day. The last anthology was Alan Riddell’s book, published by London Magazine Editions in 1975. 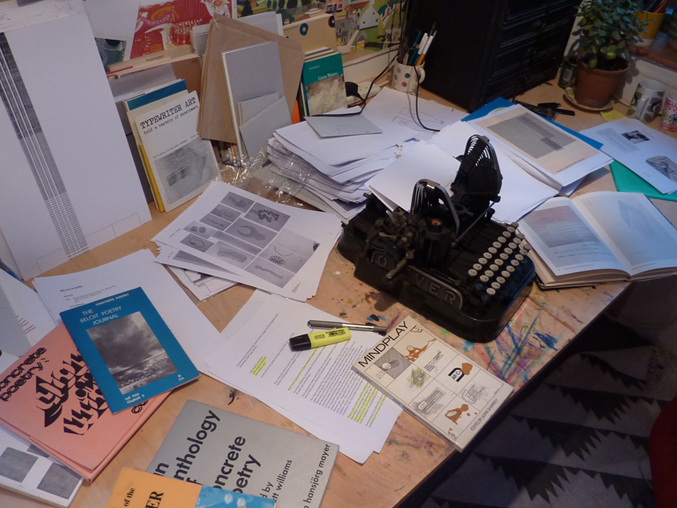 As you can see, he’s surrounded by research, but it’s OK. He’s got a yellow highlighter. When he accepted the commission, he thought he had a pretty good idea of the work that was out there. He’s since found out that he knew nothing … and every time he thinks he’s found out as much as he can, he finds more. 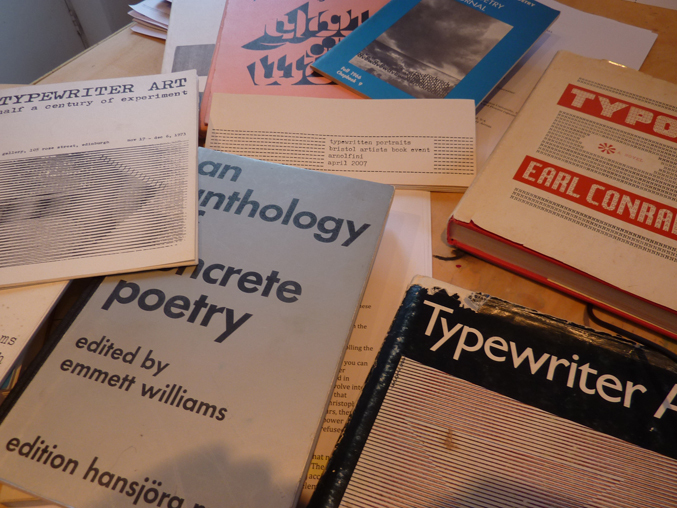 The week before last, he spent a happy two days with designer John Dowling going through the long-list of images and managed to produce the short-list (that’s the pile of it above). Now he’s got to go through that all over again and whittle it down to about 200 pieces of work. Of course, he’s not really writing it on a 1903 Oliver Standard Visible Typewriter. That woud be silly. The Oliver No. 3 doesn’t have a backspace so it’s impossible to make corrections on. He’s actually using this laptop. Would you look at the state of that screen though. Eye magazine have noted us this month, which is a delight. 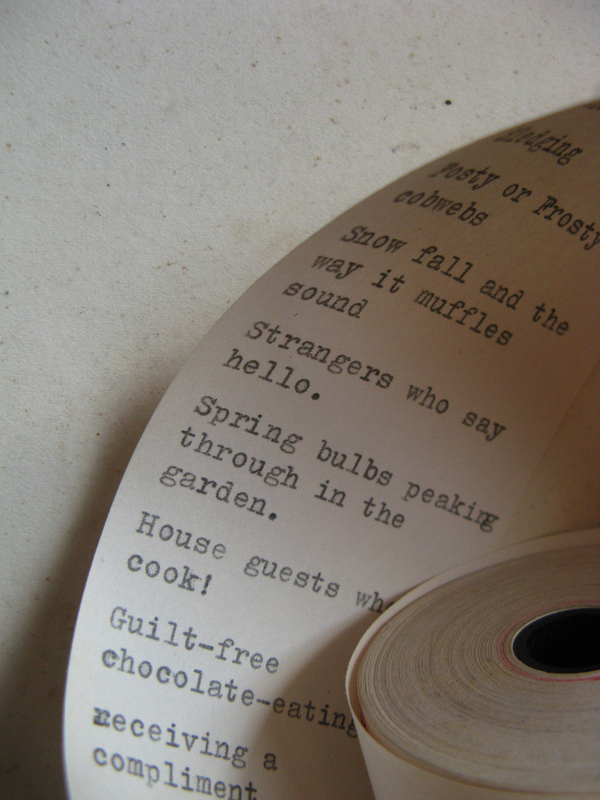 The Onion Merz Poem Number 8 caught the mood of the week as its typewritten bellyband coincided with the last ever British-made typewriter leaving the Brother factory in Wrexham. And the answer was? No it wasn’t. 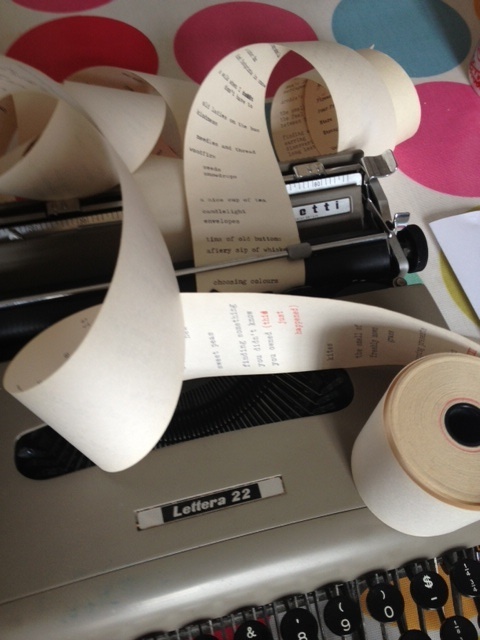 So, in order to get the book ready in time for the Scottish Poetry Library Book Fair (By Leaves We Live), he invented a plan B and typed up some bellybands instead. The rest as they say, is a happy accident. 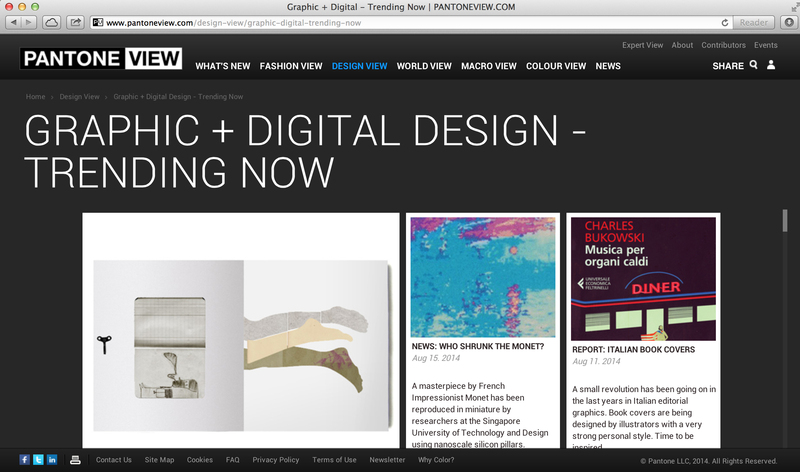 The Ghost in the Fog made another appearance too, on the pages of the International Design Observatory. It has a walk on part in a Thesis exploring non-linear narratives.